It was obvious by the number of unfinished paintings in the studio that Dennis had been working hard all month and was carefully choosing the best paintings to complete for Gallery shows. It's always a special treat to be allowed into his studio and be able to look around and see so many wonderful landscapes. Mixed in with the landscapes, there is an occasional still life or a marsh scene with wonderful figures waiting to be completed, allowing them to come to life. Here is a small peak at Dennis's painting setup. The class demo was a repaint of an old painting that wasn't up to Dennis's high standards. The repaint consisted of sanding down the canvas and painting over the entire canvas with a completely different scene. A quick try in a frame to add more to the final touch of orange/pink sunset hint. Many new students have been coming to class, and this month we enjoyed having a graphic artist from Connecticut. Laurie drove 2 1/2 hours to join the class for the day. She had been wanting to experience being taught by Dennis and said at the end of the day she was very happy that she had come and hoped to return. I've been enjoying your posts, and I look forward to meeting at the reception tomorrow night, and to seeing your work. Thank you for visiting my blog, what an honor to have you writing the first comment on my ramblings. We all enjoyed having you and Todd visit our Newburyport Ten show at Angles & Art in Haverhill, MA. Many of us are looking forward to attending your May workshop at Maudslay State Park, Newburyport, MA. Quick question, what oils does Dennis use? Really good blog btw, I look forward to more! Thank you for taking the time to write a comment on my blog, it's so nice to know people are reading my entries. I'm waiting for Dennis's permission to send out a list of his palette of oil colors. If you would prefer, please send him an email at sheehanstudio@aol.com. Dennis spends time getting the perfect color and is careful not to over mix the colors allowing for variation in each brush stroke or palette knife application. Please feel free to email me at sbluca@gmail.com. I Love your paintings , I can see lots of Dennis Sheehans inspiration in them! You are embarking on a very exciting path, enjoy. The darks in the paintings are done by combining the Transparent Red Oxide and Phthalo Green plus sometimes small portions of other colors. Please remember to maintain your own style and only copy other artists for practice, not sale. I'd enjoy seeing your paintings, which if you want, can be emailed to me at sbluca@gmail.com. Susan, I have not got any paintings worth sending as of yet, but I will make a note of your email, thank you. The only thing I am a little confused & concerned about is the drying time in between sessions, do you and Dennis use liquin original to speed up the process? I assume your paintings were worked on from underpaintings? Yes, the paintings are seldom completed in one session. Liquin could be used but I use Grumbacher Pale Drying Oil which Dennis uses. If I need a painting to dry quickly I dry it with lights. I have a photo light that I use and sometimes use a warm light bulb used to keep chicks warm after birth. Dennis has some demos on YouTube which show the method of applying a dark paint and then wiping away the darks with a Bounty (textured towel) paper towel. Notice the palette knife work in the above YouTube demo. Dennis has moved to a more direct method of painting now but the YouTube demo methods are a great way to start because it helps one get good compositions. Dennis like most artists is constantly trying different methods which is one reason his classes are so exciting. Use a retouch varnish before applying glazes. The retouch will allow you to remove any paint you decide does not enhance the painting. Thats great Susan, thanks for the tips, and the videos I just watched are amazing. I really am thinking about taking his classes now. Look forward to seing more of your paintings and workshop photos on your blog. Eventide Gallery http://www.eventidestudio.com in Essex, MA carries paintings by Susan Luca and Dennis Sheehan. The gallery is down the hill from the The Village Restaurant in Essex. 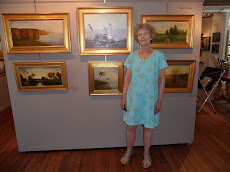 Teri Ermano runs the gallery and also is in charge of Dennis Sheehan's art classes. A visit to the gallery is a real treat and Teri is a wonderful person.